Yacht&Smith Neck Scarf with Buckle, 50s Style Retro, Vintage Tie Shawl Wrap (Chains) - Womens Fashion Scarves at low wholesale prices. 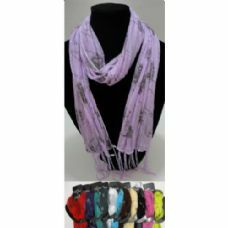 alltimetrading.com offers Womens Fashion Scarves at bulk discounted prices. Get a 50s style retro scarf to sport with your outfits for a cute and fashionable look. 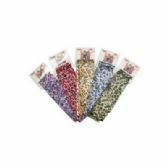 Each pair features colorful designs and patterns to accessorize and cover the neck area. Perfect to go with your vintage outfits or for daily casual wear. Includes the faux leather buckle for tying. Can be worn in different ways including tying it or using the buckle to tie it. Gives off a clean and trendy look. 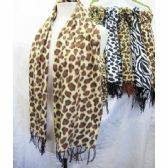 This lightweight scarf is comfortable to wear for long periods of time. 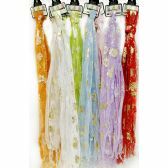 Can also be tied around your head or worn as a ponytail scarf. Perfect for all season wear including warmer seasons as a fashion accessory. The vibrant colors and patterns are perfect for upscale events as well. Great for events and various occasions. For wearing casually, parties, mystery event, dance, trivia night, cosplay, high school reunions, themed parties, costumes and much more. There is no limit to how you can accessorize with this scarf. Choose from various colors and styles for ladies. Makes a perfect gift for the holidays, birthdays, and more. Easy to store away by tying around a bag or placing it in the bag. Made with polyester. SCARF SIZE - 23 x 23 inches. ACCESSORIZE with a chic graphic printed fashion square from YACHT AND SMITH. 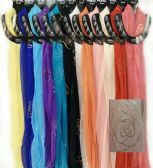 These classic 1950�s style neck scarves are coming back into fashion for those who like to add a little something vintage to their look. Coming with a faux leather buckle and measuring out at 23 inches by 23 inches, they work for any occasion. Wear it with a pair of aviators for a classic pilot look or with a blouse to add a little prep to your day. They also work as a headwrap when you want a way to keep your hair out of the way. Don�t waste your time with cheaper versions with the pattern on one side, step into the world of Yacht and Smith and the quality and style you are looking for. Order now to get FREE SHIPPING.